The Erlanger Health System has a rich history in Chattanooga, Tennessee beginning with the placement of the cornerstone for Baroness Erlanger Hospital in 1891. This major medical center serves patients in Southeastern Tennessee, Northeastern Alabama, North Georgia, and Western North Carolina. 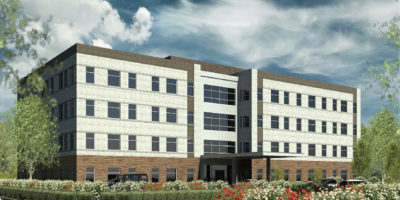 The Cancer Center at Erlanger East Hospital will offer convenient and centralized patient access to diagnostics and care. Johnson Development worked with Erlanger Health System to create a flexible financing model to allow a fast-track start and the possibility of physician investment. Johnson Development will serve as developer, managing member of the ownership entity, and the property manager.